A powerful anti-aging treatment with Vitamin A Retinol and 10x the concentration of our proprietary botanical complex to support collagen production and renewal at the cellular level. YOUTH® Activating Serum has 10x concentration of our patent-pending Youth Complex and gentle encapsulated Vitamin A Retinol to provide the critical regeneration step. It addresses multiple signs of aging, supports collagen and elastin production, and accelerates skin cell renewal to a more youthful rate for superior radiance and rejuvenation. Used as part of the Advanced Anti-Aging Regimen, YOUTH Activating Serum helps minimize the appearance of pores, improve skin texture and elasticity, and reduce the appearance of fine lines and wrinkles. Powered by: 10x concentration of Youth Complex featuring botanical extracts and gentle, encapsulated Vitamin A Retinol. Use after the toner or Radiance C+E as part of our Advanced Anti-Aging Regimen, or after the YOUTH Moisture Activating Serum in our Personalized Regimen. 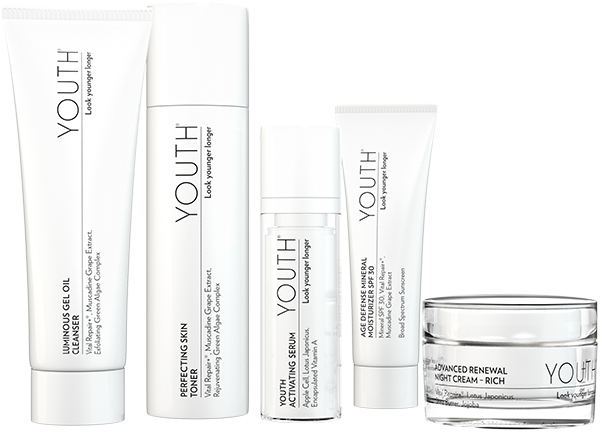 The YOUTH® skin care collection offers clinically proven products created in harmony with nature. Our promise is that you will not only dramatically improve the appearance of your skin with YOUTH, but it's 100% guaranteed to shift your skin to a younger age. We've proven you don't have to sacrifice safety and purity for efficacy. YOUTH products are all 100% vegan and cruelty free. And our comprehensive “Free of” list contains over 2,500 harmful chemicals and questionable ingredients that you will never find in any of our YOUTH products. YOUTH is powered by gentle, encapsulated Vitamin A Retinol combined with the power of botanicals in the patent-pending Youth Complex. Apple Cell Extract - Helps accelerate skin cell renewal to a more youthful rate. Lotus Japonicus - Activates a key youth protein to regenerate cells to produce more collagen and elastin. Schisandra Chinensis Fruit Extract - Helps provide more nutrients and energy to the skin. Muscadine Grape - Protects and repairs cellular DNA in your skin while blocking collagen and elastin breakdown. Vital Repair+® Complex - Multipatented Advanced Vital Repair+ Complex provides antioxidant nutrients and essential vitamins to block skin-damaging free radicals and encourage healthy cell growth. Use after the toner or Radiance C+E as part of our Advanced Anti-Aging Regimen, or after YOUTH® Moisture Activating Serum in our Personalized Regimen. YOUTH® Skin Care Usage Infographics. The must-have product in the YOUTH® Anti-Aging collection to rejuvenate skin. Youth Activating Serum has 10x concentration of our patent-pending Youth Complex plus gentle, encapsulated Vitamin A Retinol to provide the critical skin regeneration step. Use after the toner or Radiance C+E as part of our Advanced Anti-Aging Regimen, or after the YOUTH Moisture Activating Serum in our Personalized Regimen.